One of the criticisms lobbied at GM — and really, almost any car company — is what it chooses to share publicly. So despite indications from top brass that the automaker would be more communicative, why are there still measures to keep media from disseminating information to the public? General Motors Co., on the heels of claiming a renewed focus on transparency, prohibited reporters from e-mailing from within its shareholder meeting. The company allowed reporters into its annual meeting while requiring them to turn off their cellular phones in a departure from previous gatherings. Reporters were allowed to send e-mails from another room nearby that the automaker set up at its Detroit headquarters for the media gathered to watch the meeting on monitors. This, after GM's board of directors called for a culture change at the automaker to be more open with consumers (and presumably, the media that reports to them) and weeks after Barra herself testified to legislators that the company would be "fully transparent." So why the tight leash on reporters all of a sudden? GM invited only 10 print reporters to the GM Ren Cen headquarters for a press briefing with Mary Barra. Tightly-controlled, hand-picked reporters were there. The usual gang that could be counted on to ask questions that would not shock or otherwise fluster the new CEO. 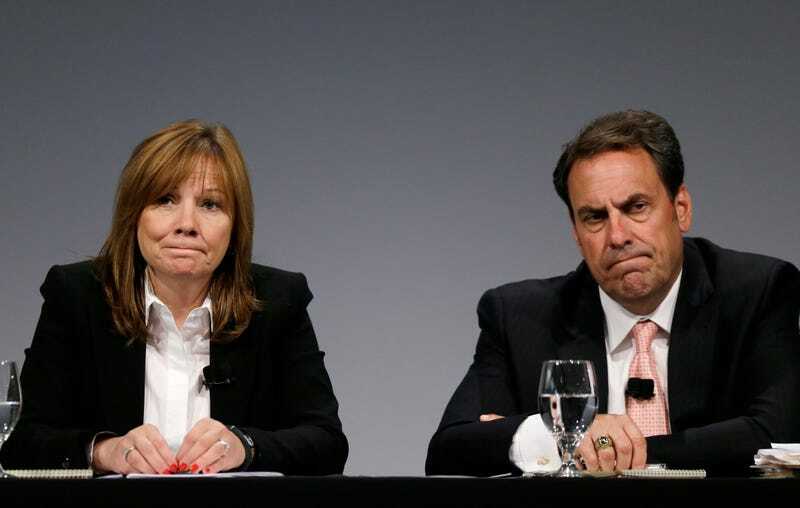 CNBC's Phil LeBeau was invited to listen in on the phone as Mary Barra talked about the biggest crisis at GM since its bankruptcy. It was nut cutting time at the Ren Cen and instead of having the nation's broadcasters, or the local broadcasters who talk with their shareholders and employees every night, they chose to just go with the arm's length print medium. In thinking back to the GM bankruptcy, CEO Rick Wagoner, as beleaguered as he was, would stand up and answer every question at press conferences that included every manner of reporter and camera. GM was in crisis, it was looking for a handout that it eventually received from the federal government and Wagoner took the public beating he so richly deserved. He was the multi-millionaire executive, his desk was where the buck stopped and he knew he had no choice but to be held accountable. That's how it is supposed to work. It was unpleasant, but Wagoner stood up before shareholders, employees and the nation to answer the toughest questions in the full light of day. No coddling there. Fast forward five years and the new media handlers around Mary Barra believe she is too delicate a flower for that. In her honeymoon period as the top executive, proud to acknowledge her salary will eclipse $12 million this year, a woman who is highly touted as a GM lifer who has been through and seen a lot is somehow and for inexplicable reasons being held back from the true test of her leadership: true accountability in the sunshine. They and GM's attorneys obviously believe she is either too new or inexperienced to answer questions on camera with all those pesky bright lights. The tightly controlled and amateur looking video of Mary Barra GM put out yesterday appears the most the management and media relations seem to be able to live with. Ladies and gentlemen the building is burning! What in the world is going on here? To those looking in, it might sound like sour grapes that reporters complain about access and favor, but we're not talking about the usual free press cars and lavish trips. It's a crisis that everyone is paying close attention to. GM already isn't going to come out of this smelling like a rose, so there's no use in trying to spruce up what's already filthy. Any reporters who have had some questionable experiences with GM as of late are feel free to dish with a burner account in the comments below.